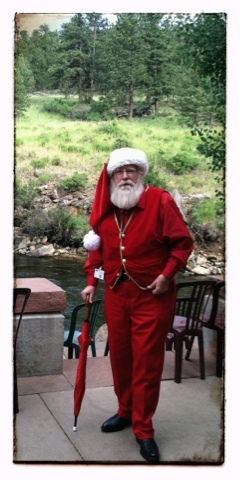 Several years ago, my friend Morty Mortenson of thefiberglassmanifesto.com joined a group of us on our annual fly fishing trip to Gunnison, Colorado. I remember that we were fishing a stretch of the Taylor River, and Morty pulled out a strange looking rod with no reel. He explained that it was a Tenkara rod, which is part of a fly fishing system based on a traditional Japanese fishing method in which a fly is fished from a flexible rod with no reel. Morty was really talking the system up, and I decided to give it a shot, as strange as it seemed at first. Morty had tied a wet fly on, and on my first cast, I caught a trout. It was an interesting concept, yet I really didn't get into it right away, but the seed was planted. My friends, noconympher.blogspot.com, JT, and BV, and DG were present as well, and all took a polite look at the rod. It was an interesting concept for sure, but after Morty traveled back home, we really didn't examine it further right away. Morty had planted a seed, and during the last couple years, Noconympher and JT purchased Tenkara rods, and have become passionate advocates. As you have probably seen on noconympher.blogspot.com, they have fished many bodies of water, with great success, using Tenkara. BV scored a Tenkara over Christmas as well, so I knew that there was something to it! 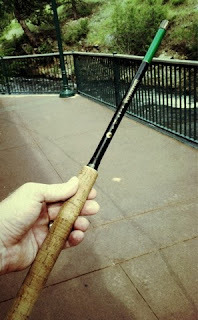 After hearing, repeatedly, how great it is to fish Tenkara, I started to think about it again. Recently, Morty graciously sent me a loan of one of his rods, the 13 foot AYU model. 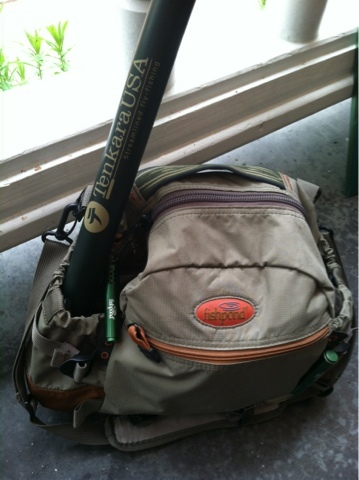 Tenkara is a telescoping rod that is very compact, and fits into a very small rod case. As you can see in this photo, I can stick the tube in one of the pockets of my Fishpond bag if I wish. With no need for a reel, it is a very compact and efficient fishing system. 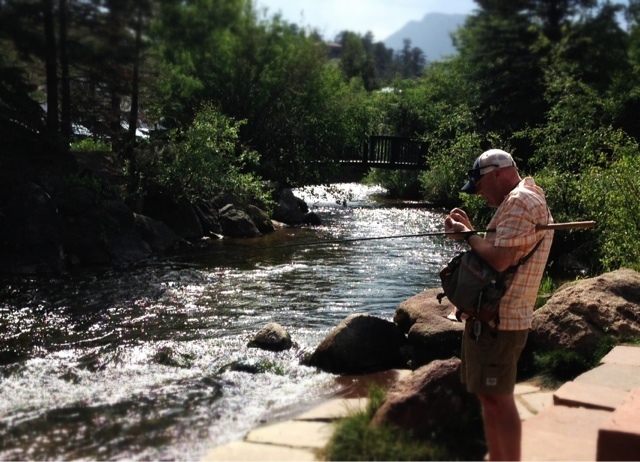 Last week, while visiting Estes Park with the family, I had about 30 minutes to fish. Normally, it would take a while for me to gear up with the reel, line, etc. With Tenkara, all I needed to do was extend the rod, attach the leader and big dry fly, and I was ready to fish. I fished right in the middle of town on the Big Thompson, surrounded by tourists. With Tenkara, there is obviously a much shorter line, so I didn't have to worry about my backcast snagging the wig off of an unsuspecting visitor from another state. The Tenkara is a pleasure to cast in tight water with trees and bushes, and can make a fine presentation of a big dry fly. 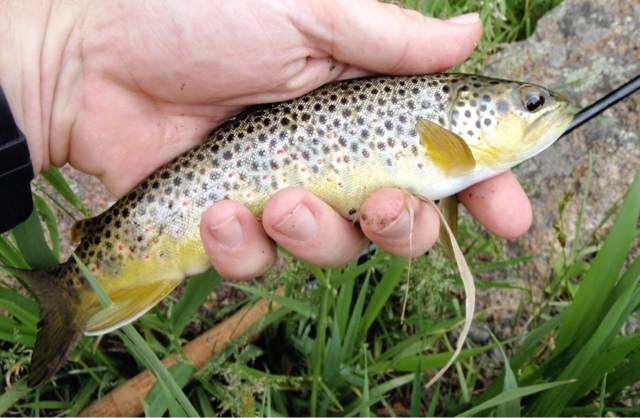 I quickly caught my first trout on the Tenkara, a fiesty brown. It was no trouble bringing to hand, and after releasing it to the cold mountain water, I quickly collapsed the rod, stuffed the small rod tube into my bag, and met the family at our favorite local restaurant for dinner. The Tenkara may not be for every fishing application, as I have seen JT standing on the edge of the Gunnison staring at a 25 plus inch trout cruising away with his fly. However, I've seen JT and Noconympher catch plenty of big trout on Tenkara, on all sorts of water. I've really enjoyed the time that I have spent fishing Tenkara. Although I will continue to fish my other rods, Tenkara really fits a need that I have. A very compact system that will catch fish at a moments notice. It is a great rod to keep in the car, or take on a trip when you have limited space. You will catch fish on it..I'm now a believer. The Tenkara rod earns Dry Fly status.